There aren't too many people that have a disease referred to by their own name. However, such is the case of the all star baseball player Ludwig Heinrich Gehrig, or Lou Gehrig. 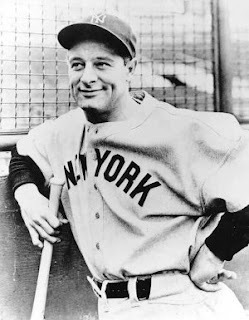 Born in 1903, Lou played for the New York Yankees until being diagnosed with amyotrophic lateral sclerosis at the age of 36. This post though isn't about him or his disease as much as it is about the idea of hope. There's an intriguing post up on ESPN entitled "Sincerely, Lou" which documents correspondence between Lou, his wife, and physician during his 2 year battle and ultimate death from ALS. The site has both a short video summarizing the letters as well as copies of some of those letters for readers to peruse. Reading through all the letters myself I was struck most of all by the concept of hope. This is evident in several ways. One way to search for hope is to look for survivors. Lou does this in his letters, telling his doctor about people he encounters with either presumed ALS or other similar muscular neuropathies that have been cured. Like little ornaments of hope, these names continue to crop up during his correspondences. Another way people search for hope is in cures themselves. I wanted to laugh and yet felt a strange pity reading through all of the types of cures that Lou tried. He took everything from high dose vitamin E and B, to histamine injections, drinking raw vegetable juice, apple seed oil, heat treatments, etc. With each new possibility he'd write to his doctor asking advice, sometimes trying them and other times passing them up. Almost every letter included some talk of proposed treatment and new research. Probably the most startling display of hope comes from the direct questions, pleas and responses between the 3 parties. I have included excerpts from the letters, which were made available to ESPN through the Rip Van Winkle Foundation. How often do we hear this excuse for hiding prognosis, that the truth's shock would actually hasten the disease process! The doctor evidently goes along with Eleanor's request and responds, "I cannot do other than remind you of the fact that other patients have gotten down to the point where they have been in bed...before started to note a favorable swing upward. The probabilities are that you belong in this same group." What an tremendous example of hiding truth in the name of hope. Lou Gehrig died June 2, 1941, possibly still believing in that 50/50 chance of recovery. Special thanks to Pallimed reader Susan Lysaght for alerting me to this story! Great find Amy and Susan. The writings in the letters sounds so foreign to the words we write today. In them exist a certain formality I doubt we shall ever see again, yet i strive to recreate in my blog comment here. It is rare to get such a open and raw insight into motivations. NPBH I have seen that video before. Very moving and insightful. When my father was actually diagnosed with ALS it was Dec 23, 2006. I had already suspected since July of that year. At my mothers funeral people kept asking me when my father had a stroke. He hasn't I would answer them. The VA had done an MRI..., said he had not had a stroke, so in their infinite wisdom sent him to speech therapy. I knew. In my gut. I had to practivcally throw a temper tantrum to get him to KU. I think he knew also. When he was offered the medication that MAY give him a few more months he refused. No one played games with him. Thank God. Thank God for Dr Baron at KU. He knew what was to come. He never lied to my father. I think it is cruel to not let a person know the truth so they can plan. Say what they want to say. Get things in order. So other people can say what they needed to say. All of us, including my father, gave ourselves quality time that was so precious. No pretending was in it. He knew, we knew. we loved. "The Woman Who Decided to Die"